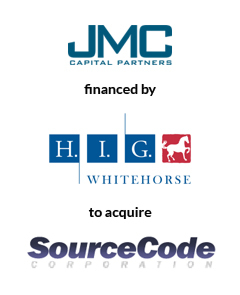 AGC Partners is pleased to announce that its client, JMC Capital Partners, has purchased Source Code Corporation, a leading provider of high-performance computing solutions and associated managed services, for approximately $90 million in cash and debt. To complete the transaction, AGC raised $55 million in 1st Lien Debt financing consisting of a $50 million 1st Lien Term Loan and a $5 million Asset-based Credit Facility from H.I.G. WhiteHorse. The transaction closed on May 4, 2018, and the debt proceeds are being used to fund the acquisition of Source Code. With a team led by Doug Hurst, AGC Partners acted as the exclusive financial advisor to JMC.